When Jeff Gibson and Ron Semelsberger first met during their days at RentWay, they developed a strong mutual business respect for one another. As the years went by and they continued to work together, their business respect grew into a friendship that led them into discussing the future that would eventually lead them into opening their own store one day. 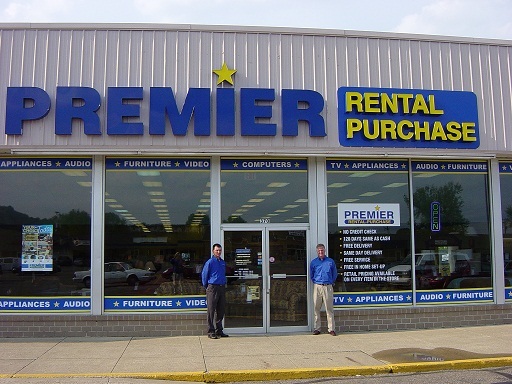 That finally happened in April 2009 with Jeff and Ron opening their first Premier Rental-Purchase store in Coshocton, Ohio. Over the top customer service and always striving to listen to their customers during difficult times is a top priority for the Coshocton Team. Prior to opening their Premier Rental-Purchase, the duo found it challenging within a large corporate structure to offer the type of service they KNEW their customers deserved when times were difficult. Now owning a Premier franchise, they are able to make those types of decisions themselves and know they are doing the right thing. "Premier allows us to run our business and make the decisions we feel are best for our customers", says Jeff. "We attribute that to part of our success. We believe that our customers appreciate that we genuinely care about them and are willing to listen to them, and that we've earned their trust along the way in doing so. Our team of Jimmy, Jerry, Jedd-a, Gregg and Jason has virtually been with us from the day our doors opened two years ago. They know our customers and more importantly, our customers know them!" The Premier family prides itself on certain core values and this is the perfect example of why Premier Rental-Purchase IS "The people you know and trust."